Teiglach! This sweet honeyed dessert reminds me so much of my childhood Rosh Hashanah dinners. It is a mountain of baked or fried dough balls that are combined with nuts, dried fruits, and sprinkles by a honey syrup. And though it looks complex, it is stupidly easy. Though teiglach, for me, tends to be specific to the Jewish Holidays, it’s a close cousin of the Italian struffoli, which is traditionally served for Christmas or Easter. So, you can feel good about serving this sticky treat for any occasion, really. I added flaky sea salt and rosemary to my version because traditional teiglach is very sweet (hello, honey) and both of those ingredients tone down the sweetness. I also added almond extract to my dough, which makes for a more complex overall taste. The almond, rosemary, sea salt, and honey also play very well together. I baked the dough because a) it’s marginally easier; b) it’s marginally healthier; and c) I hate nothing more than smelling like fried oil. Don’t be afraid to overbake the dough balls slightly as this will help them to stay crunchy when they’re covered in honey. The only tricky part is making sure the honey syrup doesn't burn. I will admit that during recipe testing, I didn't turn the heat down fast enough and my honey almost boiled over. I used it anyway and it was completely fine. One quick note: This is a relatively small batch of teiglach. So, if you're feeding a crowd for the holidays, I would double it. Preheat the oven to 350. Line a sheet pan with parchment paper and set aside. In a large bowl, combine the eggs and olive oil and whisk until well mixed and lightly bubbly. Add the lemon zest and almond extract and whisk again to combine. Add the flour, sugar, baking powder, and salt and mix just until all of the flour is incorporated. It will be a thick batter. Turn out the dough onto a lightly floured surface and knead 5-6 times, just until it feels a little springy and less sticky. Divide the dough in half and roll out each half into a long, thin snake, about ¾ of an inch thick. Chop the snake into ½-inch pieces. Roll each piece into a small ball. The balls should be between the size of a dime and a nickel. Bake at 350 for 20-23 minutes until the balls are lightly golden brown and hollow sounding. If you feel like they’re not browning, check the bottoms. If they're golden brown, the balls are done. Remove from the heat and let cool slightly. While the balls are baking, roast the nuts in a toaster oven or stick them into the oven with the balls (on a separate sheet) until they start to smell nutty. Remove and let cool. Chop roughly, if desired. Mince the rosemary and set aside ½ tsp. 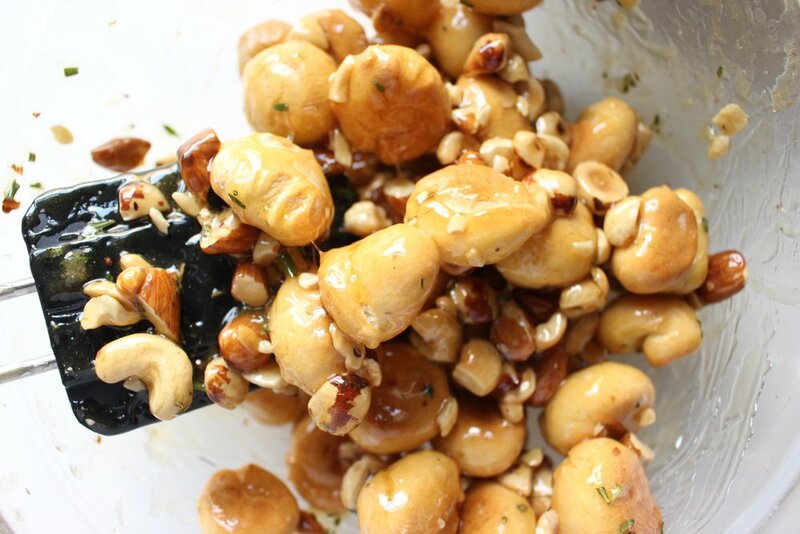 Combine the mixed nuts, 1 tsp of rosemary, and ½ tsp of flaky sea salt and mix well. Once the balls are out of the oven, in a small saucepan, bring the honey and sugar to a boil over medium heat, stirring often. 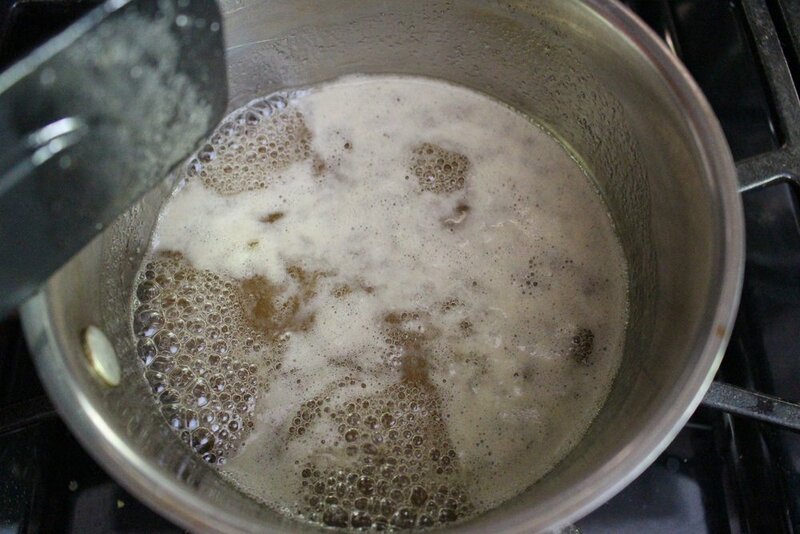 Once the sugars starts boiling throughout (not just on the edges), reduce heat to low and simmer, stirring often, for 2-3 minutes. Remove from the heat. Place the balls in a large bowl with the nuts, rosemary, and salt and stir. Pour the honey mixture over the cookies, nuts, and spices and mix well. This will take some elbow grease as the honey cools. Pour the entire mixture into your serving bowl making a pyramid shape as your pour. If the honey is too warm and the mixture won’t form into a mound, let it cool for a few minutes and try again. Once you get the mixture into a mound, let cool completely in the fridge. Bring back to room temperature for serving. Just before serving, top with the remaining ½ tsp of rosemary and ¼ tsp of flaky sea salt. This dessert is best served the day it's made, but will keep well, covered with plastic wrap at room temperature, for up to two days.